There is only one commercial site in the United States that can provide global solutions capabilities for all Navy equipment qualification testing, as well as extensive test and qualification capabilities for ground, avionics, and space applications. This test site is the Rustburg Division of National Technical Systems, strategically located in Central Virginia, within driving distance of the Eastern seaports, various military bases and Government facilities, major prime contractors, and Washington D.C. 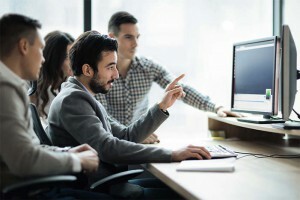 Besides geographical and environmental factors, what makes this test and engineering support site appealing is its unique blend of capabilities and proven expertise spanning from engineering analysis and simulation to various levels of physical testing for virtually any size EUT. The main purpose of qualification testing is to ensure that the equipment will perform reliably and according to the operational requirements once it is integrated in the end-user platform. To this end, emulation tests are usually divided into two categories: those tests that subject the EUT to the environment in which the equipment will have to operate (susceptibility tests), and those tests that evaluate the effects that the EUT will have on other systems which are part of the overall operational environment (compatibility tests). Along these lines tests can be environmental in nature (e.g., shock and vibration, temperature and humidity, drip and immersion, airborne and structure borne noise, etc.) or electromagnetic in nature (e.g., EMI, EMC, ESD, magnetic, power quality, etc.). 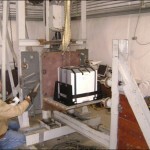 The hardest tests, from the EUT point of view, are those that apply very high energy levels to the equipment during very short periods of time to emulate, for example, the near-hull explosion of a submerged mine or a torpedo, or the electromagnetic pulse caused by the detonation of a nuclear weapon in the stratosphere. In the first case, Heavyweight Shock tests are performed according to MIL-S-901D using Floating Shock Platforms (FSP, up to 70,000 pounds) and Extended Floating Shock Platforms (EFSP, up to 125,000 pounds). To fully emulate the reverberation modes caused by the shock waves generated by the explosion of strategically placed underwater explosive charges, equipment carrying Deck Simulator Fixtures (DSFs) are installed on the floating platforms (barges) in order to provide the 8, 14, 25, and 40 Hz damped oscillatory stimuli to the installed EUTs. In this emulation scenario the main shock wave and secondary shock wave caused by the explosive bubble hit the barge (left) causing the DSFs to produce the reverberation modes as well as transmitting rotational and athwartship forces which also stress the equipment and any installed shock absorbers. 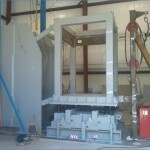 For smaller EUTs (up to 1,500 pounds) a Deck Simulating Shock Machine (DSSM, right) can also be used to optimize test time and associated cost. This machine (DSSM) was very recently qualified by the Navy and it is the only one available at a commercial test site (the Navy has the only other existing DSSM). For yet smaller EUTs, the Lightweight Shock Machine (LWSM, left) is routinely used. All these platforms and machines (and associated tests) are Naval Sea Systems Command (NAVSEA) certified. 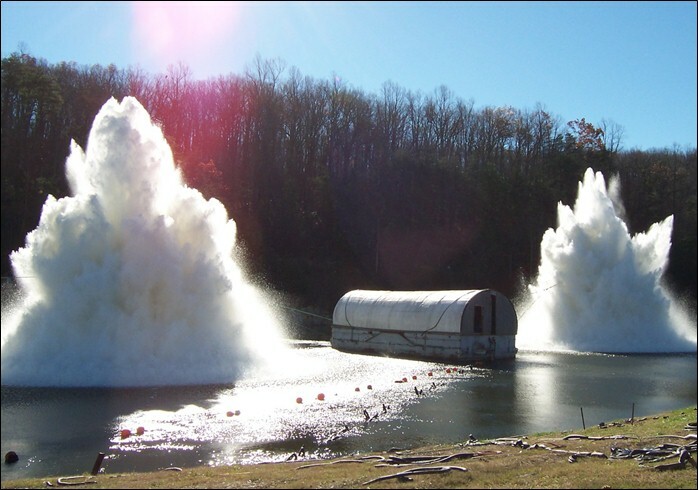 Other environmental tests performed at NTS Rustburg include Vibration (MIL-STD-167), Temperature, Humidity, Drip and Immersion (MIL-STD-810), and Airborne and Structure Borne Noise (MIL-STD-740-1/MIL-STD-1474D and MIL-STD-740-2). 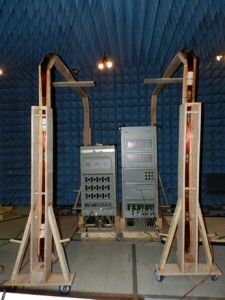 Electromagnetic testing capabilities were added fairly recently to NTS Rustburg (May 2012). The new Electromagnetic Interference (EMI)/Electromagnetic Compatibility (EMC) facility is A2LA certified for MIL-STD-464 (system level environmental EM), MIL-STD-461 (EMI/EMC), MIL-STD-1399 Sections 300A and 300B (shipboard power quality), MIL-STD-704 (aircraft power quality), MIL-STD-1686C and DO-160 Section 25 (Electrostatic Discharge), DOD-STD-1399 Section 070 (DC Magnetic Field), and RTCA/DO-160F-H (Aerospace). 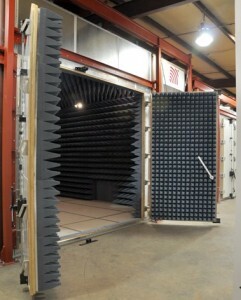 The semi-anechoic test chambers (above) are also used for Airborne and Structure Borne Noise testing, taking advantage of the very quiet background environment. These tests are A2LA certified as well. Each of the electrical/electromagnetic standards mentioned above are fairly complex in nature and includes many individual tests. 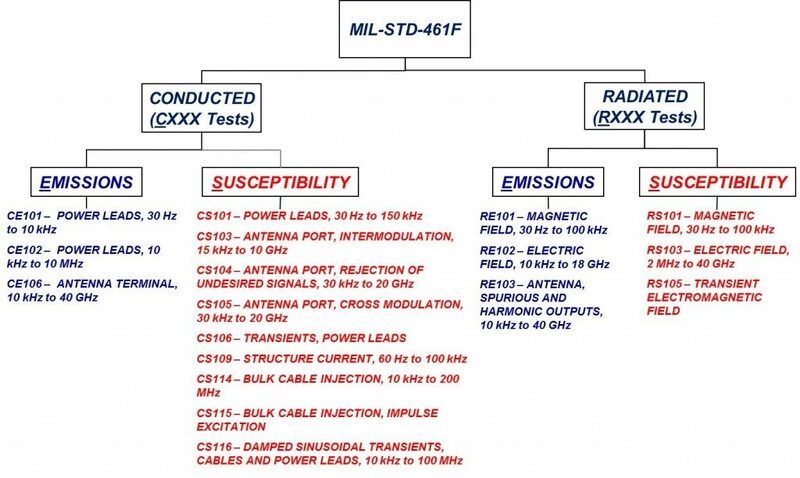 For example, MIL-STD-461F covers all test cases depicted below. In the highly competitive test and qualification market it is extremely important to continuously achieve all possible cost savings for the customer while consistently preserving compliance with the standards and maintaining the highest quality of service. Along these lines the main cost reduction drivers can be identified with expeditious, high quality documents preparation and delivery, the capability of offering all required tests at one location (to help the customer manage both travel and shipping and staging cost), the continuous optimization of test sequencing (critical path based schedule, to avoid any non-test periods while on location), and the reduction of individual tests time. In response to these challenges NTS Rustburg has been consistently delivering high quality Test Procedures within approximately two weeks of contract award, and Test Reports within two weeks of test campaign completion. 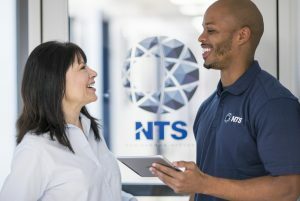 NTS Rustburg has also been consistently adding certified test cases to provide a one-stop shop for all required tests, it has adopted a sophisticated company-wide scheduler (VLAB, connected to the central ERP system) to fully optimize programs test schedules based on resources and assets allocation and availability, and it has developed standards compliant, innovative test equipment implementation and tailored test solutions to reduce test time and associated bid price and execution cost. One example of this innovation and ensuing cost reduction is the in-house design and implementation of very large Helmholtz Coils (left). These coils have an area of approximately 2.5 by 2.5 meters and can create the required DC magnetic fields (DOD-STD-1399 Section 070) and AC magnetic fields (MIL-STD-461, RS101 test method) while encompassing entire racks within the generated fields. By comparison, the traditional approach to the RS101 test has been to use a small coil (right) and apply a localized magnetic field to individual 30 by 30 centimeters square surfaces and at each electrical interface connector. 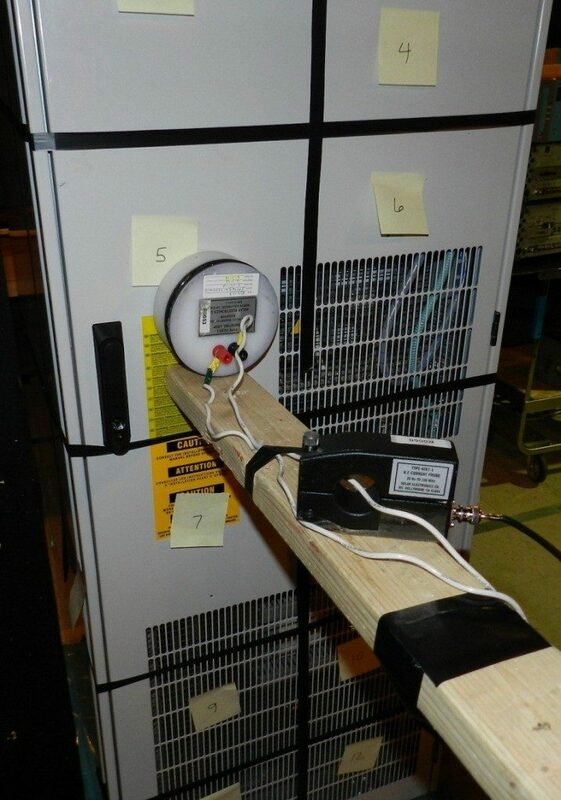 For large EUTs, using the small coil for this test can take days. With the large Helmholtz coils, besides creating a more realistic scenario by immersing the entire EUT in a homogeneous magnetic field, complete tests in all three axes (X, Y, and Z) only take a few hours, thus greatly reducing the cost of these tests to the customer. If you would like to know more about how best to expedite the testing phase of your program by utilizing the experienced technicians and engineers at NTS Rustburg, please contact the author of this article, Dr. Francesco Lupinetti, EMI/EMC Director at 434-608-1234 or Francesco.Lupinetti@nts.com.